I’ve been spending a lot of time in airports lately and while they are all pretty much the same, a few stand out. These two photos were taken at Atlanta’s Hartsfield airport which is note worthy because of its immense size and innovative vending machines. More than once, flying in/out of Atlanta someone within earshot mentioned that it is the world’s busy airport and a plane lands or takes off every 30 seconds. I don’t know if those statistics are true but I know that getting from one gate to another in order to make a connecting flight can take days. 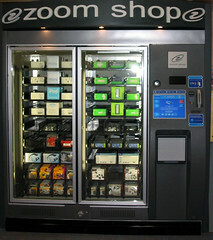 And then there are the vending machines selling iPods and iPod accessories. Although I am not as anti-iPod as some people, I don’t quite see the point of buying a music player from a vending machine in an airport. How are you going to put music on it? I suppose you could use your laptop but what about charging it? Maybe they come preloaded with songs and a full battery. It might come in handy if you are looking for a last minute gift.